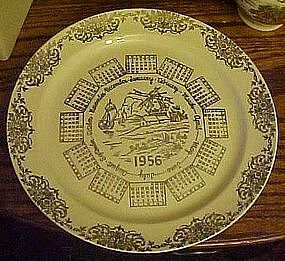 Vintage calendar plate for 1956, 10" in diameter, coupe shape, decorated with metallic gold filigree border and windmill in the center. Very good condition. No chips or cracks. Gold is excellent. No makers mark. I have other plates that are identical but just a different year.